Gee, doesn’t that sound fancy? 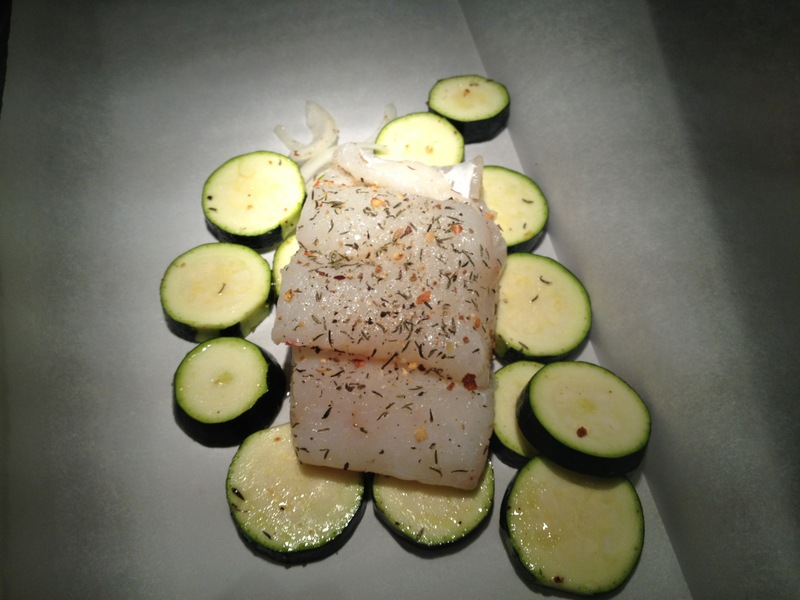 Cod prepared en papillote, served with rice. I took advantage of the sunshine today and enjoyed a long but brisk walk to Red Hook—destination: Fairway. After I loaded up on a variety of root vegetables and leafy greens, I headed over to the fish counter to check out what was on sale. 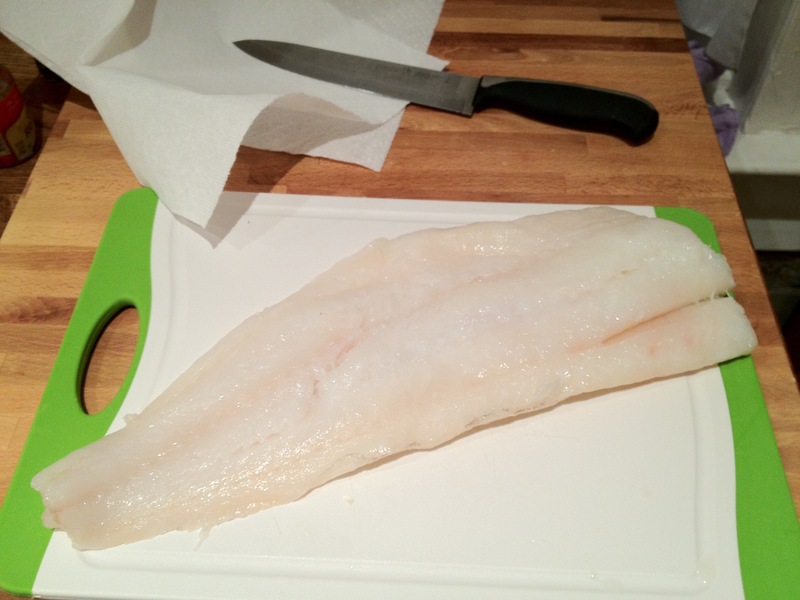 Fresh wild-caught cod filet, $7.99/pound. Sold! 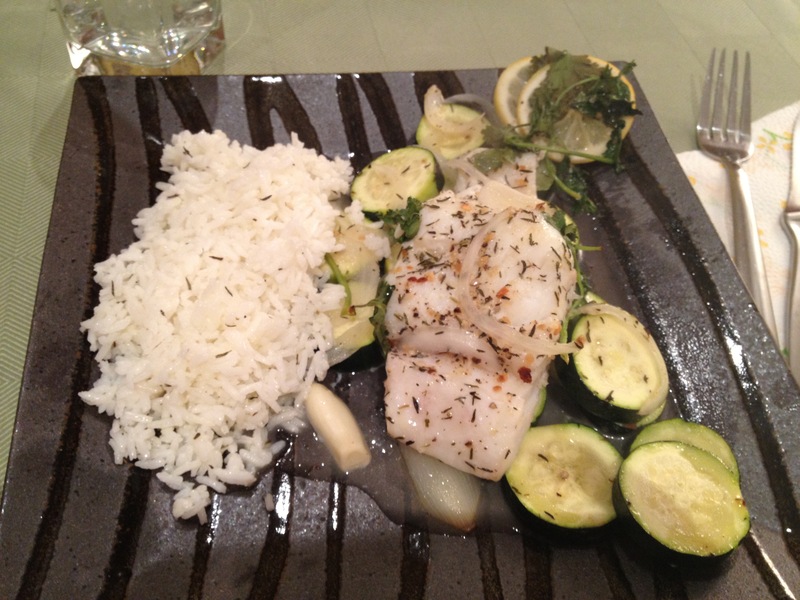 I love cod because it’s an easy fish to cook, and the options are endless. 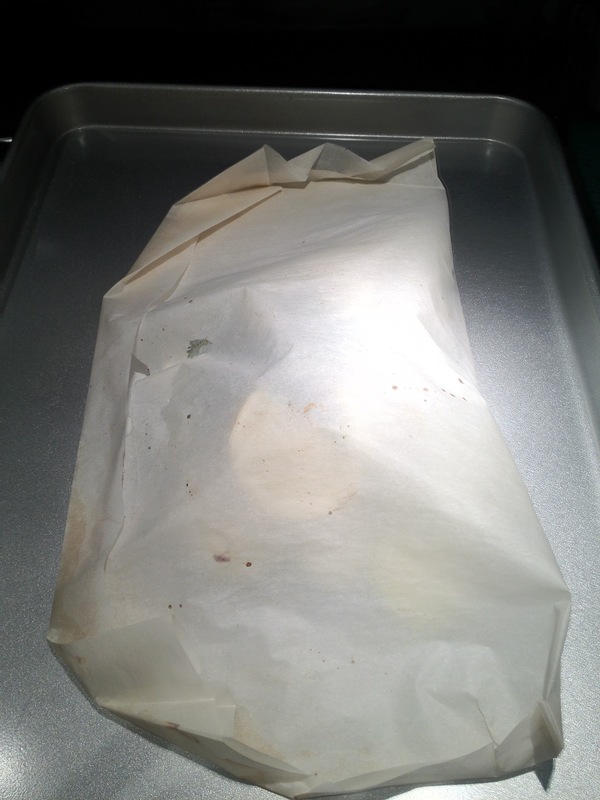 It’s mild and flaky, but thick enough to hold up to a variety of cooking methods, my favorite of which is en papillote. 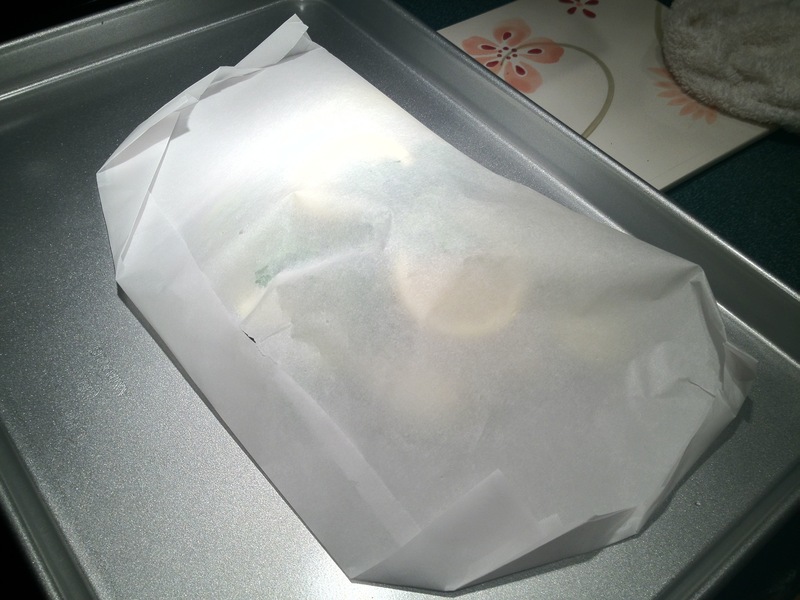 En papillote’s literal translation from French is “in parchment”, though I like to think of it more as “in a pouch”. 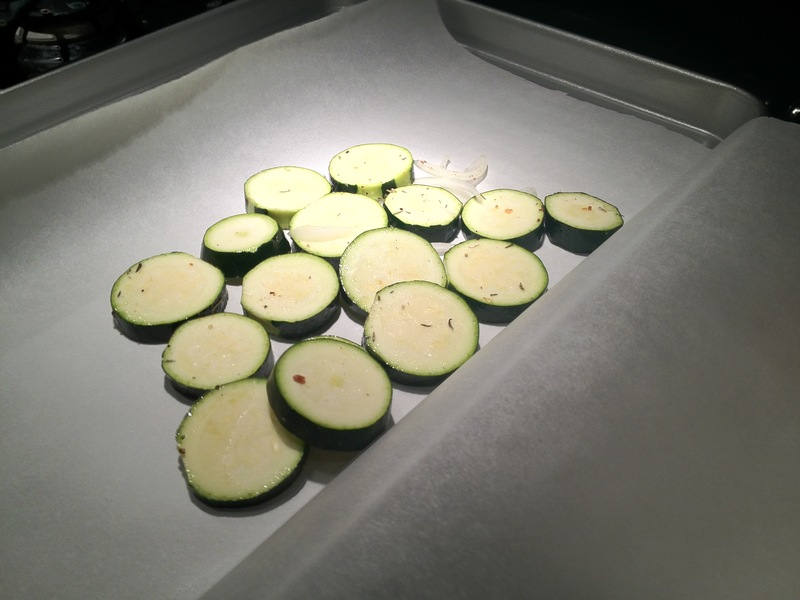 The technique is simple: fold a large sheet of parchment or aluminum foil in half, place some veggies on one half to make a shallow bed, and place the fish on top. 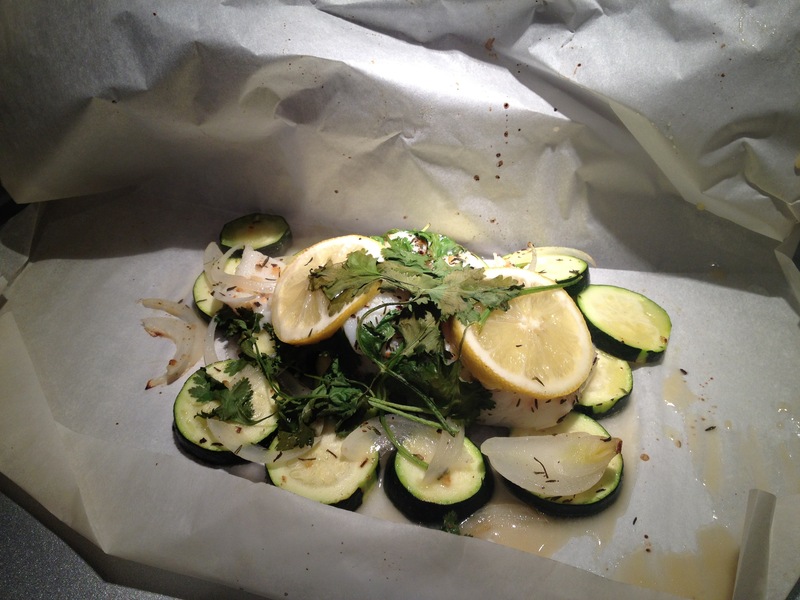 Add some aromatics and a drizzle of olive oil, then fold the pouch and seal by folding at the edges. Then bake. That’s it. The whole process from prep time through unwrapping takes under 30 minutes, and what you end up with is a perfectly cooked meal for one. The fish and vegetables steam inside the pouch, absorbing the flavors of the aromatics and releasing just enough juice to keep all the elements moist, not mushy. The fish stays moist throughout, and flakes off perfectly with the stroke of your fork. If it’s overcooked, it’ll just fall apart. The cooking time, 12 to 15 minutes at 400 degrees, will vary depending upon the fish you choose. Scrod and cod work best, as I’m sure halibut would too (though it tends to be expensive). Flounder and sole can overcook easily, so you’ll want to stick with the lower cooking time with those. Forgive the fish for hiding under the lemon. He's a little shy. Another bonus of making fish this way is that the clean-up is minimal. There are no pots to wash, no scrubbing to do. So take your time and enjoy your night. If you choose to serve the dish with rice, like I did, another 2 points for a half cup of rice and 1 for a teaspoon of olive oil. Voi-la! 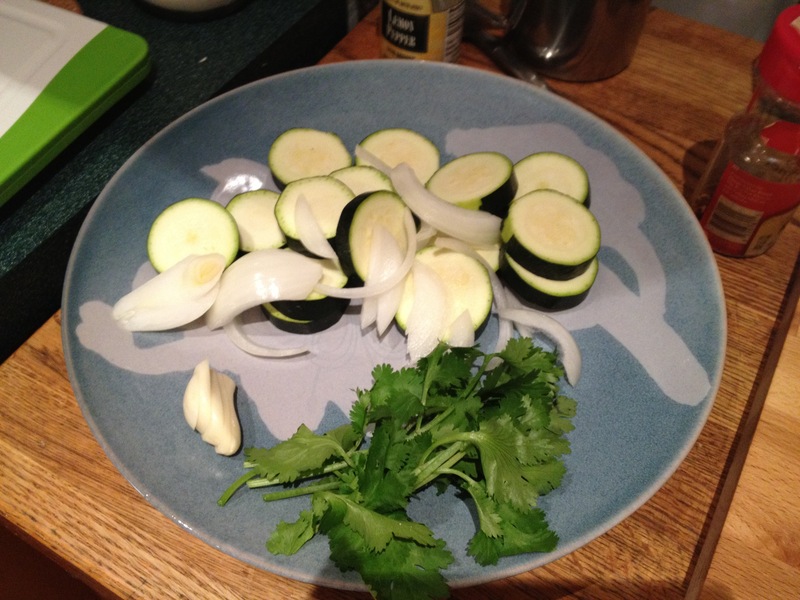 Start with the veggies and aromatics. Add the fish, after seasoning with salt and pepper. Add aromatics atop the fish. Out of the oven. Unwrap carefully. 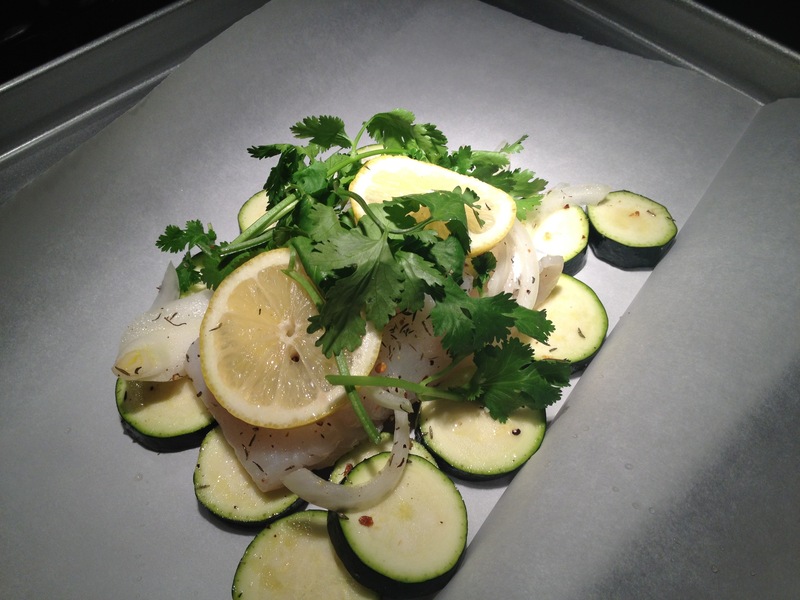 This entry was posted in Musings, Recipes, Savory, Tips and tagged aromatics, cod, dinner, easy, en papillote, fish, healthy, low fat, mains, parchment, quick, steaming, vegetables. Bookmark the permalink. I’m so glad you liked it! And thank you for the kind words. It’s become my favorite way to cook fish too – virtually no mess whatsoever. Will definitely try the honey & red pepper flakes.